Colonia, YAP – Guam’s men’s and women’s basketball teams picked up wins Monday in a double-header against Palau in the first day of action of the 9th Micronesian Games. The two defending gold medalists came away with victories in their 2018 debut with the men picking up a 77-61 win while the women won 77-41. 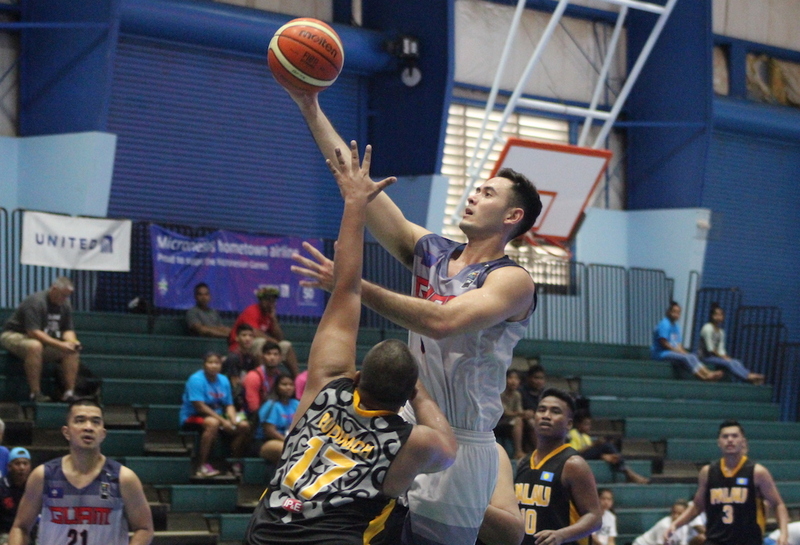 Team Guam rode the hot hand of swingman Billy ‘The Kid’ Belger in the first half where he buried three treys, en route to a 16-point total effort. Guam sat comfortably up 43-21 at the half, but a second half rally from Palau gave Guam an early test. A layup from Palau’s O. Mad cut Guam’s lead to just 10 points, 60-50. A technical foul was handed out to Palau after a hard foul on Michael Sakazaki during an inbounds play which resulted in a heated exchange from veteran Seve Susuico towards the Palau player who committed the penalty. The spark lit a fire under Guam as they buckled down on defense to quickly put the game back out of reach with three minutes left. Belger was the lead man for Guam with 16 points as Susuico added 11 with William Stinnett and Sakazaki adding 10. “This whole thing is dedicated to Thomps,” said Susuico post game, with the team sporting ‘T2’ on their jerseys in memory of former Guam Basketball President Tony Thompson. Susuico is also sporting ‘THOMPS’ on one shoe with ‘AMOR’ on the other in honor of a family member who has fallen ill to cancer. It’s been quite some time since basketball stars Destiny Castro and Kali ‘Special K’ Benavente have suited up for Guam Basketball. The two ran the show in the 2014 Micro Games in Pohnpei and they showed no signs of that changing in their debut against Palau. Castro led all scorers with 24 points while Benavente added 10. Guam faced little resistance after surmounting a double digit lead 22-7 after the opening tip. The lead ballooned to 41-19 by the half. Palau started to make a few circus shots to the delight of the crowd in the second half, but Guam would not be denied after just holding Palau to just nine 3rd quarter points.